New Orleans is one of those cities that surprises you at every corner. First impressions aside, this place has moved up in the ranks of my favourite US cities, stealing the fourth spot place from Portland. Spending most of my time with this gang of Dutch, Australians, Norwegians, French, and Americans. I didn’t realize until my last day that I was staying in Americas #1 hostel for 2106, as awarded by Hostelworld. Staying at The Auberge Nouvelle Orleans made my visit to NOLA unforgettable. Kiek and Bella from Holland were especially awesome to hang out with, always getting a laugh when I tried to speak Dutch to them (Picture at left: Kiek foreground on the left, Bella behind me on the right). 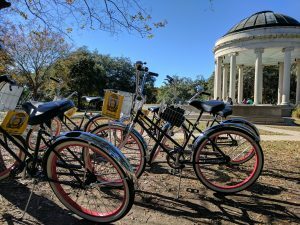 I decided to take a bike tour of the city with Free Wheelin’ Bike Tours. The $50 tour was three hours and covered the majority of the city with a focus on the “back streets” of New Orleans (officially called the Creole & Crescent Tour). My biggest mistake was booking the tour on probably the coldest day of the year in New Orleans. By the time the tour started the mercury had hit a balmy 4°C! The bikes provided by the tour company were beefy enough to handle the pothole-ridden streets of New Orleans. 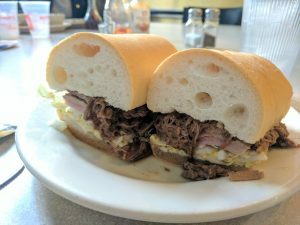 A po’ boy with roast beef, cheese, and jus. I wanted to try a po’ boy before leaving, so my recommendation was to head out to Mother’s. The key to a good po’ boy is the bread, so I was told this place had the best bread in the city. The po’ boy got its name from “poor boys”, which were two street car drivers who were selling them to other drivers while they were on strike. The bottom half of the sandwich was soaked with jus, while the top half had a soft & chewy crumb with a crunchy crust. Getting back to the hostel after lunch, I was met with a shower and a nap to recharge the batteries. 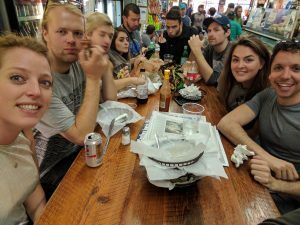 The gang was going out for a night of drinking along Frenchman Street, so I wanted to make sure I was good to go. We hit up 30/90 (again) where the group split into two. One group headed upstairs to listen to some hip-hop, while the other half (mainly me) stayed downstairs to enjoy New Orleans finest jazz. The rest of the night was quite the blur. However, my uber receipt shows me getting home at 6:30am. I’m proud to say that I didn’t party along Bourbon Street the entire time. Something I’ll save for when I go back for Mardi Gras.